Inspectors from the OPCW chemical watchdog will begin their investigation Sunday at the site of a chemical attack near Damascus, a senior official said. "The fact-funding team arrived in Damascus on Saturday and is due to go to Douma on Sunday," said Deputy Foreign Minister Ayman Soussan. 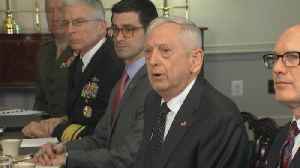 U.S. Defense Secretary Jim Mattis said on Wednesday that the Syrian government was responsible for delays in inspectors reaching sites of a suspected chemical weapons attack, a strategy they had used in the past. Rough Cut (no reporter narration).